This makes a delicious vegetarian entree or a filling side dish. You all know how to make risotto now - remember my risotto post? For this recipe, however, instead of making a saffron type risotto, I make it with a little tomato paste and very light beef broth. You can certainly use vegetable broth if you want to keep it a vegetarian dish. This dish is great because you can make it in the morning, or even the day before, refrigerate it and bring it to room temperature before baking. There is a lot of debate with cooks about whether to salt eggplant or not. Some people claim that salting the eggplant before cooking helps get rid of any bitterness. Salt does help suppress bitterness in foods, this is true, but most people rinse off the salt before cooking. Actually, the main reason to salt eggplant is to help with the amount of oil the eggplant soaks up during cooking. If you have ever cooked eggplant, you know it can absorb an unbelievable amount of oil. That is because eggplant is full of tiny air pockets. It is actually just like a sponge. When you slice eggplant and then salt it before cooking, the salt draws out the moisture and helps collapse the air pockets, so it takes on a lot less oil. It is worth doing. This recipe makes 5 rollatini. Heat a grill or grill pan on the stove. Make sure it's hot before beginning. Brush the eggplant slices on both sides with olive oil and sprinkle with salt and pepper. Grill on both sides until you have nice grill marks and the eggplant is pliable. Buona Pasqua! I've made this Easter bread for years for my kids. It's a sweet bread, made with milk and sugar and has an Easter Egg in the middle! There's a lot of Italian recipes for Easter breads, some are savory and some are sweet. This one is fun. tip: the Easter eggs do not need to be hard boiled. They cook when the bread bakes. I usually just dye the eggs right out of the fridge, without hardboiling them. Saves time. Just be careful they don't crack! In a large mixer bowl, combine yeast, warm (not hot) milk, salt, butter, eggs and sugar. Add about half the flour and beat until smooth with dough hook. Slowly add the remaining flour to form a stiff dough. Don't worry about how much flour it ends up being, just keep adding until the dough is not sticky anymore. Knead until smooth with either dough hook attachment or turn out on floured board and knead. Place in a greased bowl, cover and let rise in a warm place until doubled, about an hour. Punch dough down, divide into 12 pieces. Roll each piece to form a 1 inch thick rope about 14 inches long and, taking two pieces, twist to form a "braid", pinching the ends, and loop into a circle. Place on a greased baking sheet or line your baking sheet with parchment paper or a Silpat. Cover and let rise until double, about an hour again. Brush each bread with beaten egg wash. Put on the sprinkles. In the middle of each bread ring, gently place an Easter egg, making an indentation with the egg. Bake at 350 degrees until golden - about 20 - 25 minutes. Cool on rack. This is one of our favorite desserts. In fact, Brian and I think this could be the best dessert we've ever had. And that's not surprising because it's Lindsey Shere's Almond Tart from Chez Panisse and it was the most popular dessert on that menu for thirty years. I have to provide dessert for a progressive dinner this weekend and I knew this was what I was going to fix. I fixed a couple of them. We love it. Serve this with a glass of Amaretto and it's just about the perfect thing. 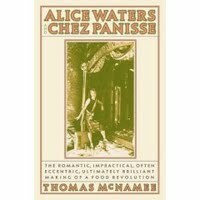 I am using the recipe given in the Chez Panisse Menu Cookbook by Alice Waters. Lindsey Shere, the original pastry chef who developed the recipe, gives a slightly different version in the biography that Thomas McNamee wrote last year about Alice Waters*. She also talks at length about how to bake the tart. Put the flour and sugar in a food processor. Process til blended. Add the butter in slices and process. Add the extracts and water and process til it gathers up in a ball. Wrap in plastic and chill until you are ready to use it. Then take it out and bring it to room temperature. Press the tart pastry into a 9-inch tart form with a removable ring. You can't really roll out this dough - it's easier just to press it in. Press the dough evenly over the bottom and sides about 1/8 inch thick. Refrigerate for about an hour. Bake the tart in a preheated 400 degree oven for about 10 minutes, until it begins to set and brown. Remove the tart to a rack and cool to room temperature. In a heavy saucepan, mix all the of the filling ingredients and cook mixture over low heat until sugar dissolves and the texture is silky, about 10 to 15 minutes. Cool the mixture slightly and pour it into the tart shell. Place a second oven rack under your baking rack and line with a piece of foil. This tart will bubble over and the foil will catch the mess. Bake in a 350 degree oven for about 30 minutes. The filling will bubble up a lot most of the cooking time and then at the end it will begin to caramelize. When the filling is golden, remove tart to a cake rack and let cook to room temperature before cutting.